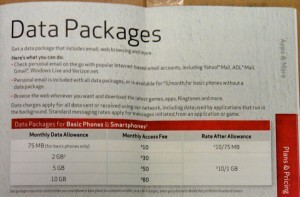 Today, there was a document leaked across the internet that clearly said that Verizon will no longer have unlimited data plans and that it was adopting the tiered packages. Verizon is reported to be abandoning its unlimited 3G and 4G data plans. However this will remain unaffected to customers who already are part of Verizon’s unlimited data plan. 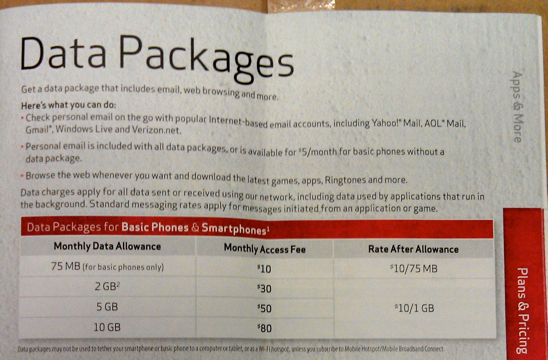 Verizon’s new pricing options are as follows. These packages are applicable to smartphones as well as basic phones. If you over use the allotted data limit, you are charged an additional $10 per 75MB and also an additional $10 for every 1GB over the plans. To add to this, you will not be able to use that data plan for mobile hotspot or tethering capabilities. You’ll have to pay for the 2GB/$20 add-on for tethering your phone. This is actually not good news since Verizon and AT&T seem to be minting money from consumers as they form almost 70% of the entire US cellular market.